Join us the third Monday of each month through November for the Foreign Policy Association’s Great Decisions Discussion. This national program is designed to engage citizens in learning about the world, and it emphasizes discussion and active participation from those attending. Each participant gets briefing books that feature impartial, thought-provoking analyses on eight issues of concern to U.S. policymakers today and will then be asked to report, either individually or as part of a group, on a specific topic. 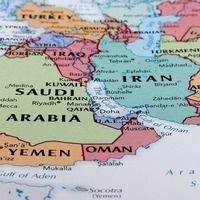 This month's topic is "The Middle East: Regional Disorder" Everyone welcome.